Let’s get straight to the point. When it comes to using bold patterns that pack a playful punch, there’s nothing we love more than chevrons. The bold zig-zagged motif adds a fun touch of whimsy to a room while still looking sleek and modern. 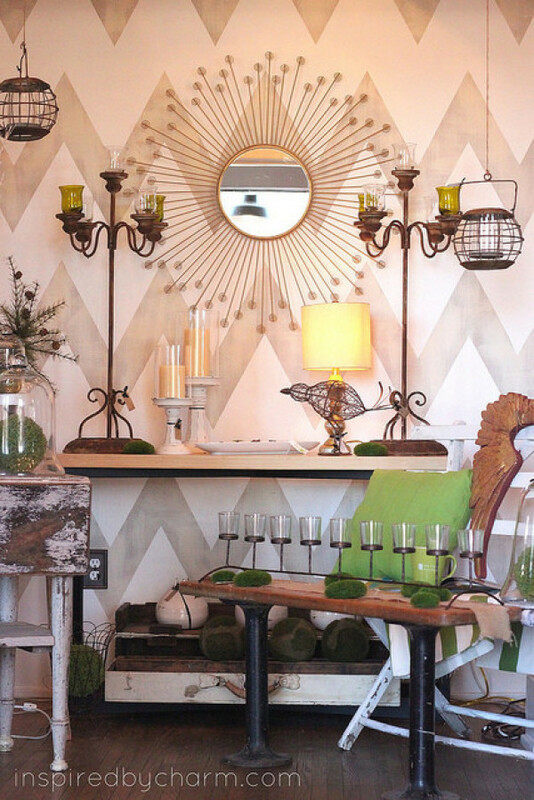 So, you can imagine our delight when we came across this on-point look created by Inspired By Charm blogger Michael Wurm, Jr., owner of Old Charm Bed and Breakfast in Saint Marys, Penn. But, while painting an entire wall with such an intricate and graphic design may seem like a daunting project, Michael says it only takes a single weekend and a little bit of math to recreate this charming DIY look. So how did he do it? First, he says, choose your paint. Chevron can be a loud pattern, so to tone things down Wurm opted for a more muted color scheme using paint he already had at home. “I decided to do everything white to freshen it up, and for the actual chevron I did a dry brush treatment to bring in a vintagey look,” he says. After painting the entire wall with his lighter base color, it was time to do some simple division. For his project, Wurm decided he wanted six different chevron points running across the width of the wall. 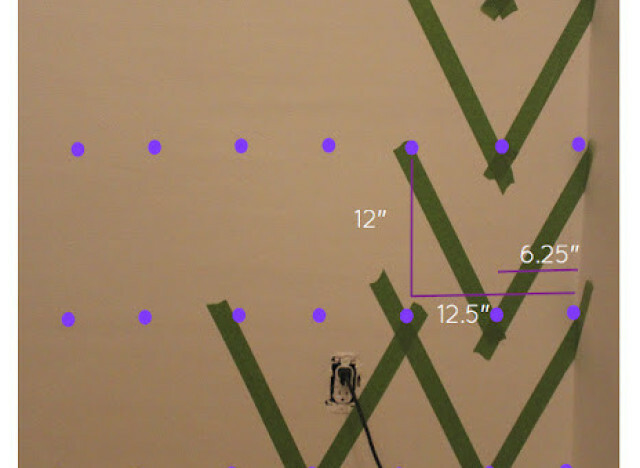 Using a measuring tape, he determined the width of his wall to be 75 inches. He divided that measurement by six to figure out how wide each full chevron should be--in this case, 12.5 inches. Next, he divided 12.5 by two to find where each half of the chevron should meet to form a point. To keep things simple, he decided that each chevron would be 12 inches in height. Then, he used a pencil to mark on the wall where each chevron would start, end and meet in the middle. He suggests using a level while doing this to make sure each row of points is even. He worked his way up from the bottom of the wall, marking off points about two inches above the baseboard. To keep the points of his chevron sharp, Wurm made sure his pieces of tape overlapped where they met in the middle. “You can see through the tape where it forms a diamond, and the tip makes the point of the chevron.” He ran an X-Acto knife around the diamond to cleanly remove the torn-off edges of the tape. He used the extra scraps to fill in the chevron rows he wanted to keep white. While painting in his chevrons, Wurm wanted to create a burlap finish to match the rustic interior of his bed and breakfast. To do this, he mixed two different colored paints--a tannish cream hue and a darker gray--and kept his brush on the dry side to create a more textured look as he painted. After letting one coat dry, he went back over with a dry brush dipped in the lighter colored paint to further define his brush strokes. As for the end result, Wurm says he couldn't be more pleased. “Even with the look of chevrons, since I did it using neutral colors you can essentially decorate with any other color and it’s going work,” he says. But for those interested in a brighter look, Wurm suggests painting the wall a single color, using glossy and flat finishes to create contrast between rows and add a subtle sheen. For the full tutorial, visit Inspired By Charm.